A beautiful classical series, combining rounded shapes with feminine florals and opulent faceted quartz, crystal and glass cabochons and Swarovski crystals. Available in silver plate/purple, gold plate/green and gold plate/browns. Available in 3 colourways - we do have all 3 colours we are just awaiting some images. A beautiful disc pendant necklace. The disc measures 4.5cm/45mm. Various crystals/stones measure 3mm up to 1.4cm/14mm. Multi-strand tiger tail cords measure 16 inches/41cm to an adjustable 19.5 inches/49.5cm. A beautiful longer length necklace. Can be doubled-up to achieve a shorter style. The periodic flower, quartz and glass discs and beads measure 1cm/10mm up to 3cm/30mm.The length is 42 inches/107cm. Clasp fastener. A beautiful disc ring. Adjustable size. The disc measures 2.8cm/28mm. Various crystals/stones measure 3mm up to 1.2cm/12mm. 2mm wide band. A beautiful cluster ring. Adjustable size. The cluster measures 2.3cm/23mm. Various crystals/stones measure 3mm up to 1.2cm/12mm. 5mm wide band. A beautiful double oval and disc pendant necklace. The oval and disc are separate, the oval is 8cm/80mm long, the disc measures 4.5cm/45mm. Various crystals/stones measure 3mm up to 1.4cm/14mm. Snake style chain (1mm thickness) that measures 16 inches/41cm to an adjustable 19 inches/48cm. 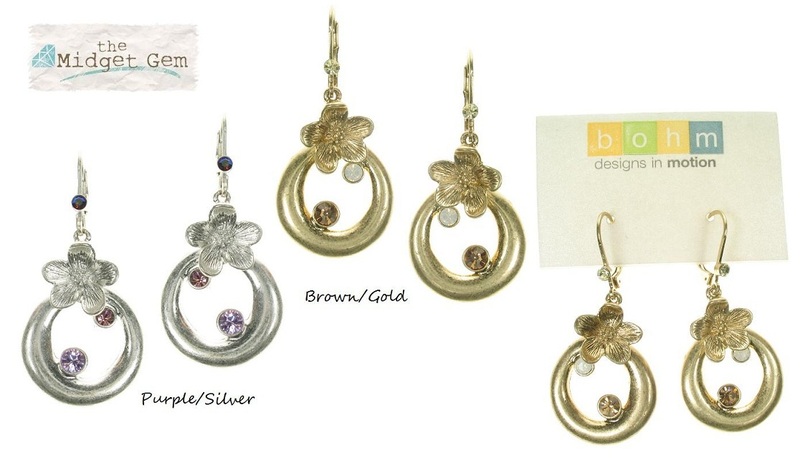 Beautiful dangly earrings from 'The Bohm'. Featuring a linear line-up of Swarovski crystals, faceted quartz beads and cupped flowers. Various crystals/stones measure 4mm up to 9mm. Total length 6cm/60mm. Post style with bullet back for pierced ears. Pretty hoop and flower earrings. Swarovski crystal details. The disc measures 2cm/20mm. Total length 4.5cm/45mm. French clip fastener for pierced ears. 3 pairs of pretty stud earrings from 'The Bohm'. 1 pair of flowers (1.2cm/12mm). 1 pair faceted glass cats eye studs (8mm). 1 pair Swarovski crystal studs (4mm). Pierced ears. Silken plates. Satin plated cupped flower stud earrings from 'The Bohm'. The flowers are beautifully detailed and measure 1.2cm/12mm. Post with bullet back for pierced ears. Beautiful flower and faceted quartz cabochon drop earrings. Natural quartz tablets measure 1.2cm/12mm and the flower 6mm. Total length 3.5cm/35mm. French clip fastener for pierced ears.